I am sure you have tried many variations of Tikka Masala before coming to this recipe page. Indeed there are many variations of this gravy all over the world. Most famous recipes in Tikka Masala Gravy are Paneer Tikka Masala and Chicken Tikka Masala. Today, I am sharing with you yet another vegetarian, perfect crowd pleaser - Tikka Masala Recipe with Cream Stuffed Fritters. 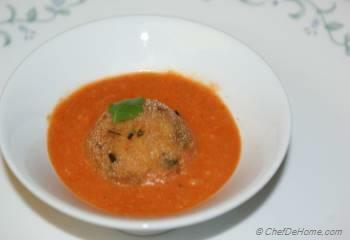 In India, this is one of the variations of Malai (Cream) Kofta (Fritters). If you ever tried Malai Kofta before, I am sure you know, these are potato, onion & carrot fritters, with cream cheese (malai) stuffing, smothered in tomato butter sauce. The traditional fritters are stuffed with Malai (cream), I stuffed'em with cream cheese for that extra oomph. Even if you decide not to make gravy, these cream stuffed scrumptious fritters are mouthwatering appetizers on it own. 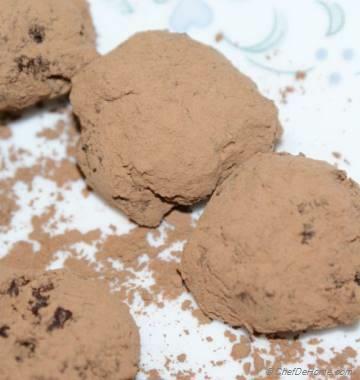 Try this delicious, traditional recipe and let me know how you liked it. 1. 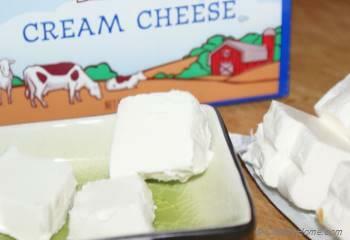 To make Cream Stuffed Potato Fritters - Dice cold Cream Cheese in 1 inch cubes and keep in freezer till used. 2. 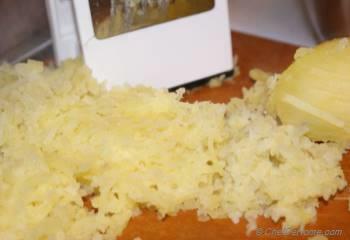 Boil potatoes till fork tender and then grate using coarse grater. Now mash grated potatoes using a potato masher. 3. Add ½ tsp Red Pepper Powder, thyme, chopped cilantro leaves, 1 tsp salt, 2 tbsp Rice Meal, Green Chili peppers chopped, grated paneer (cottage cheese), chopped ginger, chopped red onion and mix well. 4. Pour rest of Rice Meal in a wide plate. 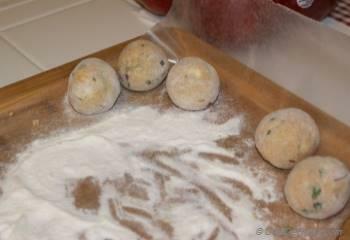 Take 1-2 tbsp potato mixture in your hand and shape it like round fritter. 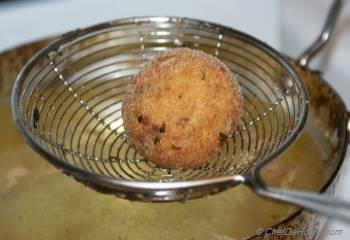 Press the fritter with your fingers to make groove in the center. Stud groove with one cold cream cheese cube and using your hands shape it again. 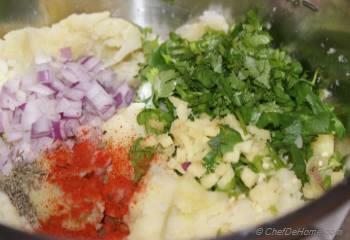 Repeat this step with rest of the potato mixture rolling about 14-16 small fritters. Make sure to keep all potato fritters away from heat source. 5. Heat oil in a deep frying pan. Deep fry fritters at 375 F for 3-4 minutes in small batches. Do not press the fritters while frying. Do no overcrowd the pan while frying since that will drop oil temperature and fritters will turn out very oily. 7. Heat 2 tbsp butter in pan. Add onion-cashews paste and fry for 5 minutes. 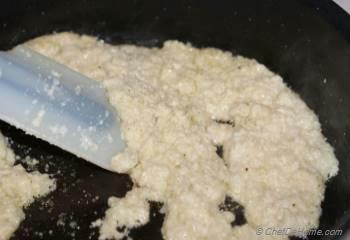 To make onion-cashew paste, bring a 1 cup water to boil. Add chopped yellow onion and cashews and boil vigorously for 10 minutes. Let it cool down and grind to make smooth paste. 8. 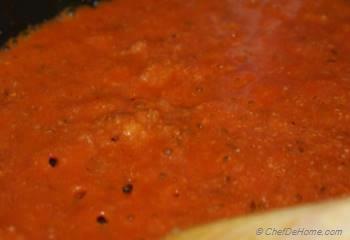 Now add ½ tsp Red Pepper Powder and ½ tsp salt. Add tomato sauce, ginger paste, garam masala and fry for 3-4 minutes. Add 2 cup water and let the gravy simmer for 10 minutes. Finish it with honey and cream and remove from heat. 9. 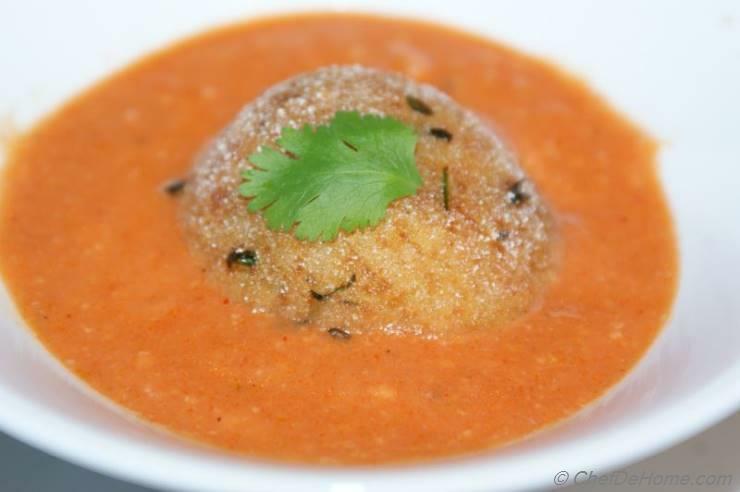 To serve, place few fritters in the bowl, ladle it with tikka masala sauce. 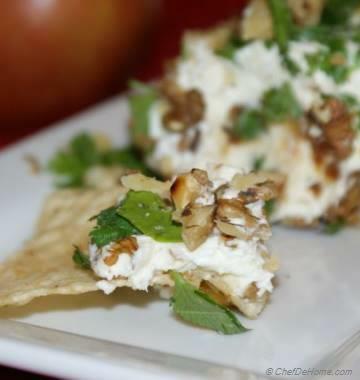 Serve with rice or naan of your choice. This gravy tastes even better if served 3-4 hours after cooking. Enjoy!! @Sima, I tried baking these fritters instead of frying and your guess is correct filling melts and burst the fritters. 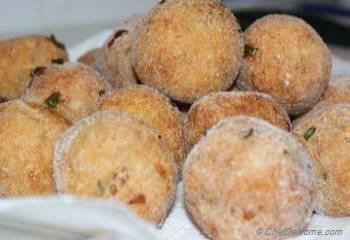 Then I used frozen cheese balls instead and fritters baked perfectly. So you can try baking these fritters with frozen cheese balls. Hi, I was wondering if its possible to bake the mashed potato mixture with cream cheese inside instead of frying it? Or will the cream cheese inside melt and ruin the whole thing? Thanks. Thanks. You explained steps so well. I can see recipe coming together from start to end. Amazing work. 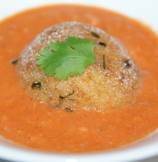 I will love to try this Malai Kofta recipe. This is definitely on my must try list… Yum! mouthwatering.... I may have to try this one soon. 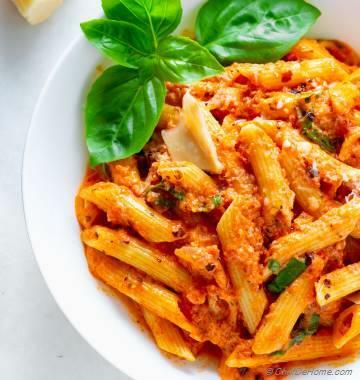 Yummm.. cant wait to try this recipe.